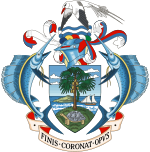 The Vice-President of Seychelles is the second highest political office in the Seychelles. The position was created in 1996. ^ Succeeded René as President. ^ Succeeded Michel as President. This page was last edited on 14 March 2019, at 17:43 (UTC).